You’d think that the Facebook headquarters would be a pretty safe place for Mark Zuckerberg to hang out, but you’d be wrong. A photo shared by the Facebook founder has revealed that even when at work, and connected to his own company’s Wifi, Zuckerberg is worried about potential hacks. Zuckerberg regularly shares pictures from his office on Facebook, but this was the first one that he’d shared that had his laptop visible in the left corner. And apart from the fact that Zuck uses a Mac (which is already well known), another little nugget of information was revealed – he has physically put tape over his laptop’s webcam and its audio jack. This is a precaution that computer geeks typically take when they fear that they’re being spied on. It’s often possible for hackers to remotely access your computer’s webcam and audio ports, and listen and watch you while you go about your daily business. And a hacker with such access would have a treasure trove of information – Zuckerberg heads one of the most valuable companies in the world, and insider access to what he talks about at work could be worth millions. Zuckerberg is no stranger to hacks – his LinkedIn was recently hacked and his password revealed (it was “dadada”). And it’s not as though Facebook wouldn’t have other security measures in place. Their office Wifi is almost certainly secured, and access to their campus is strictly controlled. 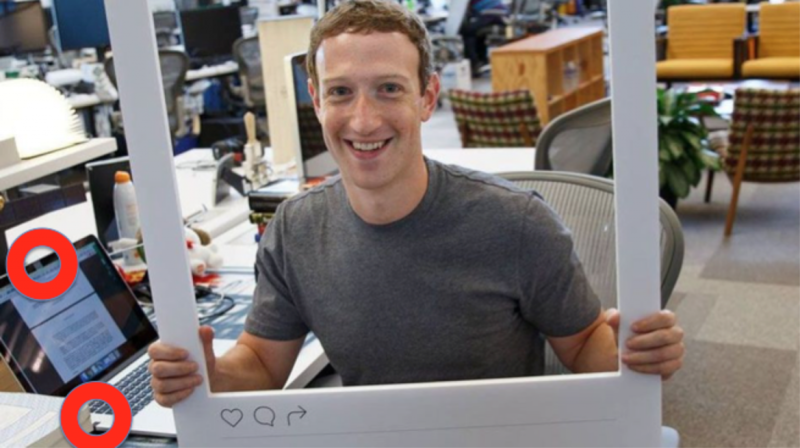 But the fact that Zuckerberg still chooses to use the old school way of duct tape over his webcam shows that no matter who you are, you can never be too careful.